If you are concerned about potential mold development in your New Jersey home or business, you should hire a certified mold professional to conduct a mold inspection in Mount Laurel, NJ. A MasterTech mold inspection will determine if a mold problem exists, how bad the problem is, and how to go about fixing the problem. At the core of every mold remediation, there are 3 key priorities. Every mold remediation in Mt Laurel, NJ should include: identifying the source, containing the problem, and cleaning and disposal. You see, mold remediation involves more than just removing the existing mold. 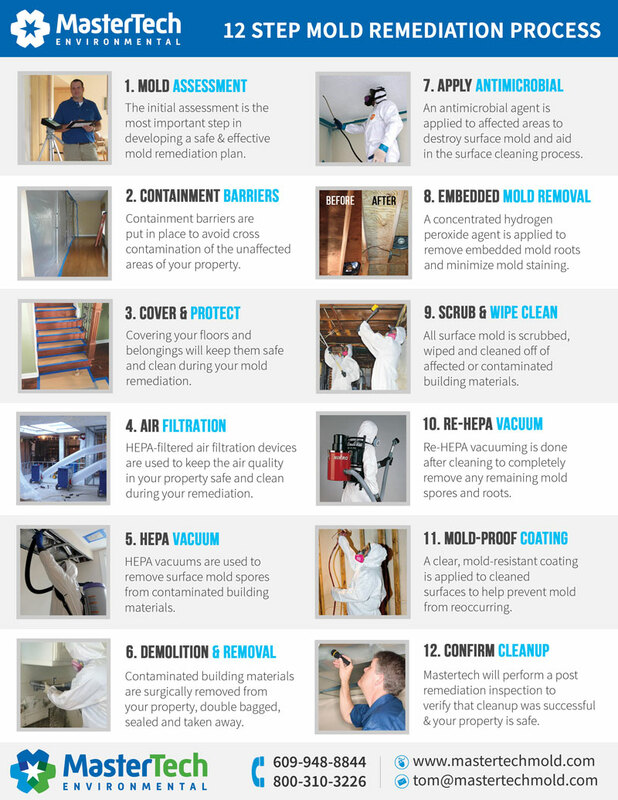 A professional NJ mold remediation company is responsible for uncovering ALL the problems related to and contributing to the mold contamination, in addition to the mold growth itself. MasterTech will always prioritize you and your family’s safety and best interest. That is why every mold removal in Mt Laurel, NJ is backed by a 5-year mold-free warranty. It is our guarantee that the mold has been properly removed, and it will not return. A poorly executed mold remediation can greatly impact your family’s health and leave you with expensive property damage. It is important to do your research before trusting just any mold remediation company with the safety and well-being of your family and your home. MasterTech Environmental has provided New Jersey families with the highest quality mold removal and mold inspection services for years. If think you might have a mold problem in your home or business, call us today to learn more about mold removal in Burlington County, NJ. For mold inspection and mold removal in Bordentown, NJ or mold inspection and mold removal in Pemberton, NJ, call 1-800-310-3226 to speak with a member of the MasterTech Team.